The Admissions Office looks forward to getting to know you and sharing with you what makes Tandem Friends School a unique learning environment. Tandem Friends School offers a rigorous college preparatory curriculum in an environment built on Quaker values. We are a coeducational day school serving students in grades 5 through 12. Our students receive an education in which intellectual, ethical, artistic, and athletic ideals are pursued. We foster capable students who: value a spiritual, egalitarian, kind, and creative community; thrive on independent, imaginative thought; are fully engaged in learning; and, seek the best from themselves and their community. Learning is a cooperative venture at Tandem Friends; the intellectual curiosity of students is paired with an academically distinguished faculty. Our strong college preparatory curriculum meets or exceeds admission requirements of all major institutions of higher learning. But there is a difference. Learning at Tandem Friends is a dynamic process of questioning and dialogue. Teachers invite a sense of authorship in their students. Classroom discussions encourage active thinking, listening, and articulation. Teachers constantly challenge students to realize their intellectual potential. Tandem Friends School encourages students in grades five through twelve to participate in interscholastic sports regardless of their previous experience or attained skill level. Our no-cut sports policy allows students to try new sports, or play multiple sports during the year. Tandem Friends has a long tradition of commitment to and accomplishment in the arts. All students are encouraged to develop and explore their unique potential in all aspects of the creative arts. In the Middle School, fifth through eighth graders take one semester of drama and one semester of art each year. Fifth and sixth graders take a music class; there is an eighth grade rock band. In the Upper School, arts electives abound in digital film, visual arts, drama, and music. Upper School drama productions (three a year) rehearse after school. Every school offers academic classes, dedicated teachers, classrooms and computers, sports fields, gyms and locker rooms. Tandem Friends is no different. What sets us apart is the amazing sense of community that exists between faculty and students, faculty and parents, faculty coworkers, the school and the many organizations our community service projects touch. You can feel it the minute you set foot on campus - a sense of caring kindness and connections to one another. Since 1970, Tandem Friends School has educated the young people of the Charlottesville area to truly "let their lives speak." And, just as we teach our students to value mankind and all that each of us has to offer, we ask you to express your support for the teaching and learning that happens here daily through the generous gifts you give. List of 26 news stories. Tandem Friends School basketball players received All-Conference honors this weekend, announced during the conference championship matchups at Highland School on February 23. Congratulations to these great players! Varsity girls honored include 8th grader Alana Carter-Johnston (1st Team), sophomore Stella Lane (1st Team), and senior Maya Goldstein (2nd team). Gordon Fields was given Co-Coach of the Year honors. Varsity boys honored include senior Jalen Anderson (1st Team), junior Dean Lockley (1st Team), and junior Kobi Copeland (Honorable Mention). 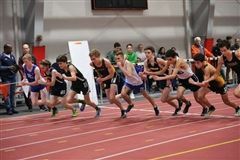 Our indoor track team had a great showing in the VISAA Indoor State Track Meet held at St. Christopher's School last weekend. Our mens 4x800 team came in fifth in the state! There were lots of personal records all around, and senior Charlie Kennedy shaved 20 seconds off of his 3200 time. It was a great season for the indoor track team and for coaches Melissa Winder, Jason Farr and Brandon Edwards. Go Badgers! It was a busy week in the Badger den, as both varsity basketball teams hosted DAC tournament matchups. The varsity boys hosted a quarterfinal matchup against Trinity Christian on Tuesday, winning in an intense matchup by a score of 65-56. Check out some footage of that game here. This put them on the road last night, playing Highland at Highland School in the tournament semifinals. They had a disappointing loss, 40-68, to end their DAC play. They await word on possible state play. Our girls won their semifinal matchup last night against Chelsea Academy - check out some great news footage here. The victory earned them the right to play in the DAC2 Girls Basketball Championship game tomorrow, February 23, at 2:00pm versus Quantico. The DAC finals are being held at Highland School in Warrenton, an hour and a half straight up 29 North. Coaches Gordon and Abby have done an amazing job preparing and guiding the girls through a very successful season. There is an admission charge for the game - students $3 and adults $5. Click here for full tournament info. The girls also ended their great year as regular season co-champions. GO BADGERS! Check out some photos of both teams here, including Senior Night pics of seniors Maya, Anthony and Jalen. Tandem's varsity basketball teams took on Randolph Macon Academy in a home double header on February 5 and walked away with two victories. In the first game, the girls came away with a 35-28 win. 8th grader Alana Carter-Johnston scored a game high 19 points. The varsity girls currently have an impressive 10-2 record, with two more games this week. They take on Chelsea Academy and Stuart Hall in away games, then return for two home games on 2/12 and 2/14 to finish the regular season. The boys game started slowly but ended in a sound defeat of RMA at 61-41. Senior Jalen Anderson was the high point scorer in that game. The varsity boys currently have a 12-6 record; they play on the road against Stuart Hall this week, then return for home games against Trinity Christian and Fredericksburg Christian on 2/9 and 2/14 to finish the regular season. Congratulations to Tandem Friends senior Jalen Anderson - named Schewel's Athlete of the Week in the Daily Progress. Jalen plays guard for the 9-5 Tandem basketball team, averaging 19.5 points per game while balancing academics and serving as a great youth mentor in the community. We're proud of you, Jalen! It was a great week for Tandem varsity basketball. On Tuesday, our varsity girls' basketball team had a big win - and first-time-ever win - over Randolph Macon Academy, defeating them 58-37. 8th grader Alana Carter-Johnston scored 21 points (she is averaging 26 points per game), Stella Lane scored 16, and Maya Goldstein put up 9 points. That put their season at 7-1 - first place in the conference. Later that night, the varsity boys defeated RMA's boys by a score of 73-50. Last night, the teams took on cross-town rival Covenant, at Covenant. The girls played first in a hard-fought loss of 31-42. Check out some TV coverage of that game here. Read a Daily Progress article on the game here. The boys team took on Covenant's team after the girls game and defeated them 70-62, with senior Jalen Anderson leading the scoring with 21 points. That's two wins against Covenant in one season, which has to be a Tandem first! Check out some TV coverage of the boy's game here. Read a Daily Progress article on the game here. It was a terrific week for boys basketball at Tandem, with our boys teams beating two major cross-town rivals at home, STAB and Covenant. In their opening home game, our varsity boys took on and defeated STAB's varsity team, leading for almost the entire game and fighting off a last quarter rally by STAB to win in a nail-biter finish of 69-68. The gym was filled to overflowing. Last night, both JV and varsity teams defeated Covenant. The JV won in a close matchup by one point with a shallow bench. The varsity kept a strong lead throughout their game, defeating Covenant 70-49. What a great start to the season! The girls team lost their season opener to Stuart Hall last night, but during this rebuilding year, coach Gordon says they just keep getting better. Check out some news footage on the recent games using the links below and check the website calendar for upcoming games. The Tandem varsity boys basketball team won Tuesday's home non-conference game against cross-town rival STAB's varsity team by a score of 69-68. The Badgers led for most of the game, fighting off a last-quarter effort by STAB to take the lead. It was a great display of the season to come and a full house in the Badger den! Check out news footage here. Tandem's fall sports teams had terrific seasons, with volleyball and soccer clinching regular season second place in the conference and both teams making it to the tournament championship finals. The cross country boys team clinched first place in the conference and fifth place in the state. Mason Love was the top runner in the conference and fourth place runner in the state. All Conference honors were awarded as follows to Tandem athletes: Soccer 1st Team honors went to senior Conor Shillue, and sophomores Josh Warren and Jake Connelly; Volleyball 1st Team honors went to sophomore Julia Dailey and 8th grader Anna Warren, 2nd Team went to senior Maya Goldstein and Honorable Mention went to sophomore Stella Lane; Cross Country 1st Team honors went to seniors Charlie Kennedy and Luka van der Pluijm, junior Meredith Frazee and sophomore Mason Love; Coach of the Year honors were given to Jason Farr. We’re really proud of our first-ever DAC championship boys cross country team! In the DAC2 championship meet on November 1 at Foxcroft School, our boys finished first, winning by over twenty points. Our girls team finished 6th, their highest year-end finish ever. In the actual race, Tandem's Mason Love finished first, Charlie Kennedy finished third with his best-ever time, and Luka van der Pluijm finished fourth. Meredith Frazee finished 13th in the girls race. As for All-Conference honors, Mason was named Runner of the Year, Meridith earned All Conference status for the 4th year in a row, and Tandem coach Jason Farr was named Coach of the Year. The Badger runners compete at Fork Union Military Academy on Saturday, November 8 for the state championship race. The Delaney Athletic Conference just announced spring All-Conference honors and eight Tandem varsity athletes were named. In boys lacrosse, seniors Noah Tinsley and Fisher Brodie, junior Logan Ratzlaff and freshman Jake Connelly were named First Team. Junior Mike Cao was named to Second Team. In girls soccer, senior Laila Whynott, sophomore Olivia Bullock and freshman Olivia Bowers were all named to First Team. Way to go, spring athletes! Tandem's varsity boys basketball team qualified for play in the VISAA division 2 state tournament - the first time our boys team will play in a state matchup. Ranked #12 in their division, the boys will play #5 seed Life Christian Academy on Tuesday, February 27 at 6pm in Petersburg at Richard Bland College (8311 Halifax Road, Petersburg, VA 23805). Note that the game is not being played at Life Christian Academy. We will be live streaming it on our Facebook page, so help us cheer on the Badgers one way or another!! If the boys win in the first round, they will play Carlisle School in Martinsville on Wednesday night at 7pm. Both of our varsity teams played great basketball in the DAC Tournament Championship games held at Highland School on February 24. The girls lost to Chelsea Academy in a tough, close game. The boys played Quantico right after, winning the tournament championship 79-65 and securing both the regular season and tournament championships. Senior Latrell Winkey scored 38 points in the game and was named co-player of the year for the conference. The Delaney Athletic Conference announced all-conference basketball honors for this season for DAC Division 2 athletes and Tandem received many nods. On our girls team, Tori Carter-Johnston and Stella Lane were named First Team and Lilah Hassell and Emma Hitchcock were named Second Team. On the boys team, Latrell Winkey and Jalen Anderson were named First Team, Logan Ratzlaff and Jacob Rice were named Second Team and Matthew McCullough received Honorable Mention. Boys coach Robert Jordan was named Coach of the Year. Senior guard Latrell Winkey was named Co-Player of the Year. What a great year for Badger basketball! Check out this great news piece on basketball players Latrell Winkey and Jalen Anderson done by the Newsplex sports team as they focused on our winning, high-scoring team. Go Badgers! Tandem's varsity volleyball team is in the midst of an amazing season, with an 11-1 record, and are in the news after a match last night against STAB broke their undefeated streak. Way to go, Tandem! Check out the local TV coverage of the game. Read about the team in today's Daily Progress. In true Tandem Friends style, senior Emma Passino didn't give up on playing lacrosse her senior year just because there weren't enough girls interested in playing. Known for her determination (she took on rock climbing for her senior project), Emma explored other options and joined the varsity boys team instead. Now she's just 'one of the guys' on the team. Check out the great Daily Progress article on Emma and Morgan Parsons, who plays on the boys team at Miller School. Click here to view some great pictures of Emma on the field. The Delaney Athletic Conference announced basketball honorees during the DAC tournament championship on Saturday, and more than a few TFS players made the list. Three varsity girls team members were honored: Senior Kate Dean McKiney and junior Emma Hitchcock were named First Team All-Conference players; junior Tori Carter-Johnston was named a Second Team All-Conference player. Two varsity boys team members were honored: Junior Latrell Winkey (who finished the season ranked was named a First Team and All-Conference Player of the Year; senior Rodes Jarman was named a First Team All-Conference player. Coach Robert Jordan, who has coached the varsity team for three years, was named DAC Coach of the Year. The varsity boys basketball team clinched both the Delaney Athletic Conference regular season championship, and the DAC tournament championship on Saturday with a stunning last-seconds victory over Quantico in the tourney finals held at Highland School. Kudos to our boys varsity basketball team - they made it to the Delaney Athletic conference tournament finals, defeating Wakefield Country Day School last night 69-58 in a home semi-finals matchup! Congratulations to our varsity cross country team on their phenomenal performance at the VISSA State Finals. The boys came in 8th in the state at the VISSA State Finals and sophomore Luka van der Pluijm placed 15th on the All State team. Freshman Meridith Frazee was 21st overall, missing All State honors by only one second. Way to go, Tandem runners! Congratulations to our student athletes receiving All-Conference honors from the Delaney Athletic Conference, Division II. Students were presented with their awards today during morning meeting by Athletic Director Al Sadtler and their coaches. In soccer: Seniors Daake Browne and Rodes Jarman and junior Keegan Brunner, first team. In volleyball: Junior Ke'alani Sison, first team; junior Tori Carter-Johnston, second team; seniors Nan Marsh and Aaliyah Williams and junior Kalina Zizulka, honorable mention. In cross country: Sophomores Charlie Kennedy and Luka van der Pluijm and freshmen Meridith Frazee and Nathan Stevenson, all conference honors. Well done! The varsity boys soccer team defeated St. Michael's yesterday by a 6-1 score. Junior Keegan Brunner scored a hat trick for the second game in a row (he scored three in Tuesday's game against Chelsea Academy). In yesterday's game, goals were also scored by seniors Daake Browne and Rodes Jarman, and 8th grader Jake Connelly. Nice playing! The Middle School cross country team competed in Annie's Run, a 1.5 mile meet held by Grymes Memorial School in Orange, with Grymes, Tandem and Madison runners participating. 8th grader Olivia Bowers finished in fourth place and 7th grader Sohpie Moseley finished in tenth place; eight other Tandem runners finished in the top twenty! The varsity boys soccer team played Fork Union Military Academy on October 4 and a TV sports crew was on hand to catch some footage. Although the boys lost 1-5, check out the great footage in this video link, which begins at minute 1:06. Tandem Friends School is a co-ed Quaker day school for grades 5-12 in Charlottesville, Virginia.